After a brief hiatus for a bit of national media attention, Celebrity Blogger Week both continues and ends with the Rev. Adam Thomas. 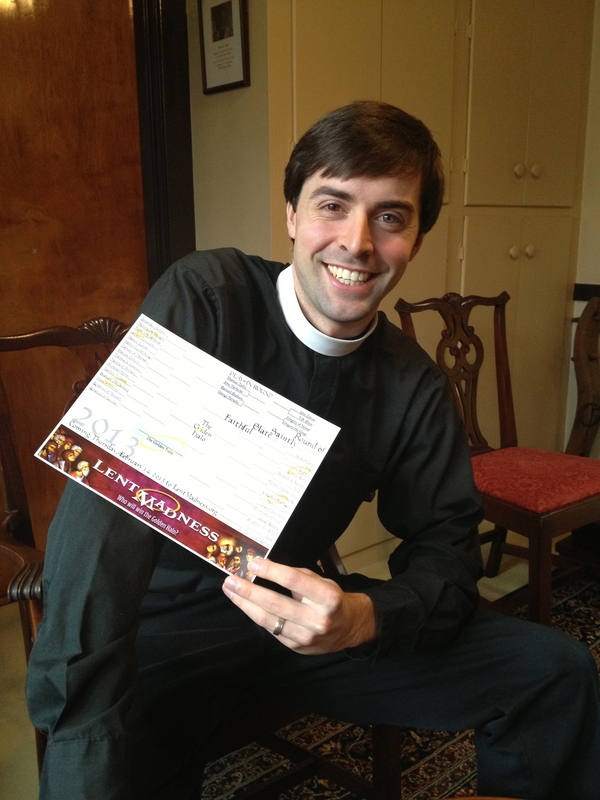 While not technically a Celebrity Blogger this year, Adam Thomas is a former CB (2012) who enjoys the lofty title of “Bracket Czar.” Adam’s one of the unsung heroes of Lent Madness who quietly goes about creating and updating brackets from his Czar-like lair. The Rev. Adam Thomas, Lent Madness Bracket Czar, was a 2012 Celebrity Blogger (most closely identified with upstart Philander Chase) who has morphed into our keeper of the bracket. He is associate rector of St. Stephen’s Episcopal Church in Cohasset, Massachusetts, which is about ten minutes away from the church of our illustrious leader, the Rev. Tim Schenck. 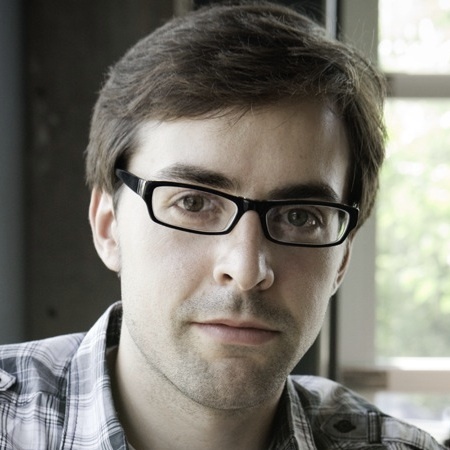 Adam is the author of Digital Disciple: Real Christianity in the Virtual World (Abingdon 2011), which you should read since you are using the Internet right now and you are more than likely a Christian. Adam just celebrated his second wedding anniversary with his wife Leah, who is wonderful and lovely and every other good adjective you might think of. He is busy being married, serving God at his church, and writing a novel, which is winding its way through the editorial process right now. Check out his website WheretheWind.com, for nearly five years of content. You can fan Adam on Facebook or follow him on Twitter @RevAdamThomas. Last year, I ran myself a little ragged pulling double duty as Celebrity Blogger and Bracket Czar, so this year I opted to stick with the one with the more impressive title. (Apparently, Tim and Scott are having a bad influence on me.) As Bracket Czar, I designed the look of the bracket and calendar, and it’s my job to update it each morning so everyone knows who won the last round. I also have access to the back end of the Lent Madness website, but I promise only to use this power for good — like fixing the broken links and spelling errors of the aforementioned SEC. Alas, I plan to spend a lot of time this Lent teaching Tim how to resize pictures in his posts. I’m a gamer and always have been. While I play some video games (Halo 4 and Lego Harry Potter right now), my main love is board games, which (thank God) my wife shares. Please understand me, though. I’m not talking Monopoly (ick!) — I’m talking about real, German board games (the Germans really know how to design a board game). If you like board games but haven’t taken the leap to the big boys, try Ticket to Ride first. If you like it, move up to Puerto Rico, Agricola, and Power Grid. You won’t be sorry. My (metaphorical) money is on Oscar Romero. 9 Comments to "Celebrity Blogger Week: The Rev. Adam Thomas"
Thanks for the tips on the German board games, which I hadn’t known about at all, and thanks for the ‘wicked” sense of humor. Seeing as how I just missed flunking Kevel I German by a hair’s breadth, I won’t be playing any German board games anytime soon. When I once made a valiant attempt to ask a foreign sounding couple, “Sprechen sie Deutsch?”. they looked quizically at me, back at one another, smirked, and said in perfect English after having said something to one another, “Speak English!”. So much for foreign relations. “German board games” are a style of game, not games only written in German. The best way I’ve heard to describe it is that in American style board games, you play the game until someone wins. In many German style board games, you play until you reach the end, and then you figure out who wins. Like in Ticket to Ride – you play until you’re out of train pieces…then you total up all the points to see who has won. They’re called “German board games” because Germany is where this style of game started. Woo hoo! Another “Geek Orthodox!” Go gamer geeks!! My current priest and my most-recent-before-my-current-priest priest are both gamers….YAY!! Love Ticket to Ride, Carcassone, Alhambra….though lately I’ve been hooked on Dominion. Everyone here is invited to our every-other-month game nights at the church (St. Charles Episcopal, St. Charles, IL). Ah yes. That’s what I miss most about the east coast- an Episcopal church every ten minutes. Here in Minnesota we pass a Lutheran church every ten seconds! In one of the towns in MN where I once lived, there were at least 8 different Lutheran churches. If I remember correctly, they didn’t speak to each other, either. You haven’t lived, though, until you’ve had one of their tuna noodle casseroles with crushed potato chips on top. Every church had its own recipe, and church suppers were considered opportunities for evangelism. Neil is right. Lutherans are everywhere in Minnesota. Lutheran ladies offer a luncheon at our county fair, so I have experienced the tuna casserole. Not exactly a gustatory delight if I’m honest, but charmingly served. Yay, fellow gamers! My family loves Agricola, Vikings, Dominion, Medici, Puerto Rico, Carcassone and every variation of Settlers of Catan known to humankind, including Star Trek Catan!